Bangalore Fort is a good place to start exploring Bangalore’s rich history. Originally constructed ruler Kempe Gowda when he founded the city in the 16th century, much of the fort was destroyed by the British in 1791, before being rebuilt by Muslim ruler, Haider Ali. But despite much of the fort now being in ruins, it’s still a peaceful place to visit and appreciate the grand stone structures in manicured lawns, set apart from the chaos of the city. Facing the fort across a busy square is Bangalore Palace, built in part from local teak, by Haider Ali’s son, Tipu Sultan. A splendid combination of Islamic and Hindu influences, the palace is still the residence for the current Maharaja and also opens daily to the public, so they can experience its lavish interiors. Beyond the fort you’ll find the busy, narrow streets of the City Market district. At the central purpose-built market you’ll find colourful spices for sale, while traders in the surrounding area can still be seen carrying vast packages of goods on their heads or being pulled on carts by buffalo. Another of the city’s key monuments built by Kempe Gowda is The Bull temple, which contains a vast ‘Nandi’, or Shiva’s bull, carved from a single piece of stone. According to legend the temple was built to appease a bull, stealing local crops and farmers still hold an annual festival to celebrate its subsequent departure. Bangalore is often called “The Garden City of India” thanks to its two famous botanical gardens, Cubbon Park and Lal Bagh. Found at the heart of the business district, the wonderful 120-hectare garden of Cubbon Park is a popular spot for locals hoping for a moment of peace and is surrounded by some impressive colonial architecture, including the red-painted Gothic-style State Central Library. 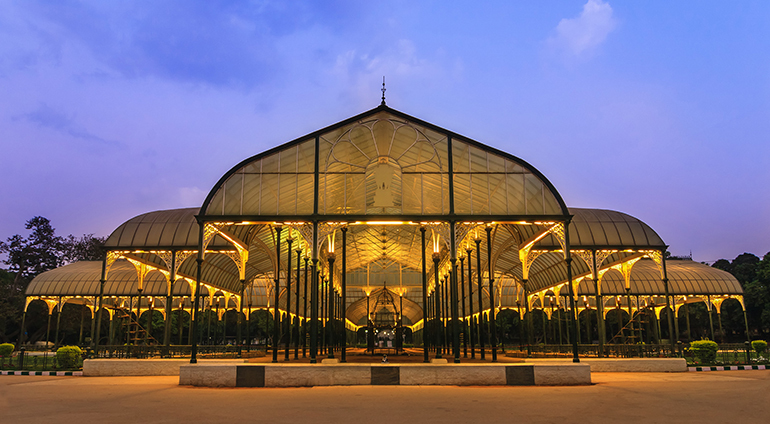 Meanwhile, the beautifully landscaped Lal Bagh Botanical Garden, with its glasshouse replica of Crystal Palace, apparently claims to be home to the world’s most diverse species of plants, including 2,000 different trees. While the original city watchtowers in the park are closed, it’s still a great place to take in Bangalore’s ever-developing skyline.